Tech support scams have made a resurgence in Grenfell. The scam is nothing new, and the same old scare tactics are being implemented. Usually, an unsolicited call from a person claiming to be a representative of Telstra, or another well-known company, will claim that your computer has been hacked. Another tactic being used is an automated call advising you that your “internet has been compromised” and that it will be cut off if you don’t act promptly. You are then required to call the scammer yourself. The first thing to note here is that Telstra, Microsoft, or any of the other companies that the caller claims to be, will not call you out of the blue to help with your “hacked” device. Often with these calls, you will notice a delay before you can hear the person on the other end. This can be an indication that the caller may be a scammer. The scammer will talk you through the steps to open Windows Event Viewer. Event Viewer keeps logs of what is happening on your machine. This includes a section that shows all the errors that have occurred on your device. 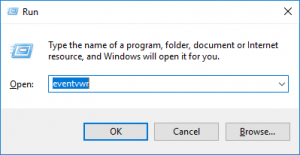 It is a simple program to open; hold the windows key and press R, type in eventvwr and press enter. To the end user, the number of errors in event viewer looks to be of concern – and that is what scammer is praying on. Unless you are having noticeable trouble with your device. The errors should not be of any concern. They are not “hacking attempts” as the scammer will try to tell you. If, so far, the scammer has convinced you that he is legitimate, you will be talked through installing a remote access tool such as Team Viewer. There are many other remote access tools that have been used. These remote access tools are legitimate programs and will not be flagged as malicious by your antivirus. The scammer is just using the tool for malicious purposes. Much like a brick is used to build a house, it can also be used as a “tool” to break into a house. The scammers tactics vary from this point onward. In some cases the scammer will ask for access to the victims bank account. The premise being that hackers are trying to hack in. Once the victim logs in on behalf of the scammer, the scammer is then able to transfer funds to his own accounts. Other scammers have installed free software to “fix” the device, after which they charge a fee – in some cases up to $1200. Once you have allowed remote access to your machine, there is nothing stopping the scammer from setting up a backdoor, stealing personal data, or from simply deleting files. Whatever the outcome, it is all bad for the victim. Caller ID: If your phone supports caller ID, screen your calls. If you do not recognize the number, or the number is private, don’t answer the phone. Of course, use this to your discretion. If you are expecting a call this week from the doctors, you may need to answer that private caller. Don’t call back: Ignore the automated message advising you to call back on a certain number. This tactic makes the scammers work a lot easier because you have called them and essentially lowered your guard. Sometime the numbers can be a premium service, meaning you may be paying per minute to talk to them. Call a Friend: If you do get a call and you are not sure, use your mobile (if you have one) and call a trusted friend or family member. Sometimes just talking out loud to someone else will help the scam stand out. Obtain a Silent Number: Telstra have removed fees associated in having a silent number. This keeps your details out of the White Pages and online directories. Fees may still apply for other telephone providers. To activate this, call your telephone provider. Register on the Do Not Call: This isn’t going to stop a malicious caller, but it will prevent some of the legitimate (but still annoying) telemarketing calls. Educate your friends and family: Share this article with your friends and family. The more we talk about the scams going around, the less likely we are to fall for them. Scamwatch is run by the ACCC. It provides information to consumers and small businesses about how to recognise, avoid, and report scams. Our Tech Tips articles also have great tips on protecting yourself online, so do check them out as well.